Have you ever sat down to make a card and what you end up with is not anything like your original thought ?? Well, that is this card !! I had die cuts in mind and an image I had already colored but instead, I pulled out some journaling cards bought at Tuesday Morning yesterday for $1.99.. I don't presently journal or do Project Life but still seem to have an addiction to journal cards.. They are perfect for quick cards and also for making sets of cards with a particular theme. When I saw the Top 5 List card, I immediately began thinking of MY Top 5 coffee list. Then I pulled out a small alphabet set and the rest is history !! I had such fun stamping all of those words and was pretty darn proud of myself at how they turned out !! Supplies : Card base is one of 100's that I have but can't remember which company -- I chose one with pretty Fall-like flowers on it; letters for Coffee words are from a Mini wooden stamp set by Hampton Art; Wooden coffee cup is by Prima Marketing Inc.; Top 5 List & Heart journal cards are from the Indian Summer line by We R Memory Keepers . The stamp for the back of this card is one of my new favorites !! Also by I Brake For Stamps. 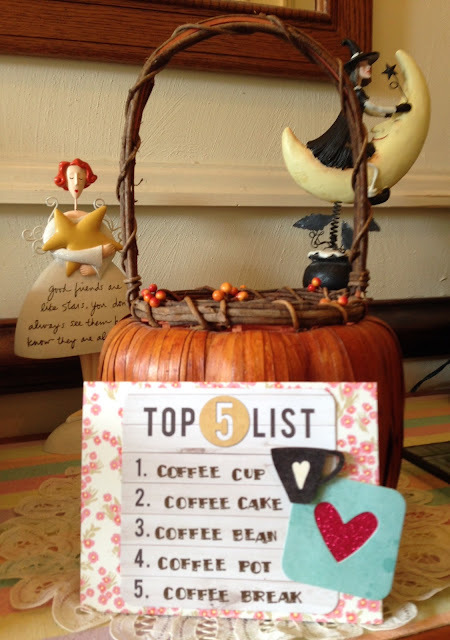 I hope that you like my second card entry for the Fall Coffee Lovers Blog Hop. Thank you for visiting Meticulosity. Please leave a comment for a chance to win some coffee goodies from me. And remember that to be eligible for any of the Flash Prizes from the Blog Hop sponsors, you have to link a Fall-themed project by the deadline of 5 pm Pacific Time on Tuesday, Sept. 29-- which is National Coffee Day !! Be sure to check out all the the amazing linked projects ( now numbering 273 ) HERE. You can also be eligible for a prize if you are one of the Superstars who comment on each and every entry. I have never been one of them but I do read each and every blog post. What a fab card Debra!! Love that stamp on the back of the card too...it's perfect! This is just an awesome journaling card!! I love the top 5 list and the items on it - so cool!!! The stamp on the back is just the coolest thing too! It is pretty darn great. One of my favorites of yours. this is so cute, I love it!!!! great idea! Love this and a very clever top 5! Fun 5 steps card, love it! Fun card, Debra! Happy hopping! How fun! love it thanks for sharing! Great idea! I love to use items for other purposes! Tuesday Morning is so much fun! Retail therapy! I don't scrapbook and I have lots of those journaling cards. I've recently realized that some card makers are using those on their greeting cards. I'm going to get out my collection of cards and start using them too. They are pretty, the sentiments are great, and they'd be a fast embellishment. thanks for the reminder. What a fun card and love the stamp on the back too. Oh, this is fun! And thanks for introducing me to "I Break for Stamps" - love the "made by" stamp. lol this is too cute and so fun Debra. Love all the pretty details in your coffee card! Very cute idea! Love the sweet posies too. Sweet and fun, and I'm all for a Top 5 Coffee list anytime!! oh my, this is such a fantastic creation! Perfect! I'm totally with you on the PL cards...I have TONS. Love your fun project Debra! Oh, this is sooo fun and cute!! 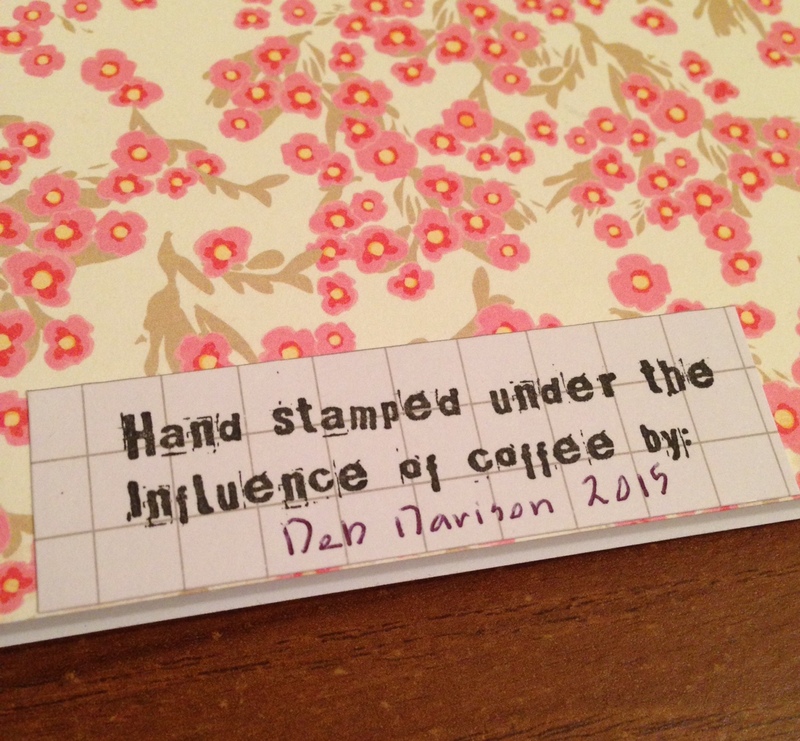 LOVE that under the influence stamp! Fun project! Look at you, using alphabet stamps to make your own sayings! I'm sure I have several little alphabet sets around here but have never used them...shame on me! How clever!! Yay for your Top Five !! Love this list so much!!! Such a fun and creative idea! LOVE THIS basket list! So creative! cute - love the list and your handstamped by message! 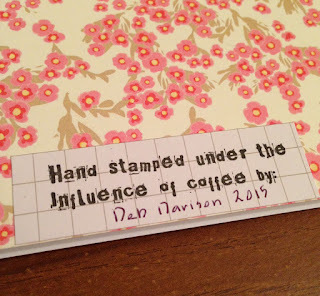 Like your sentiment and the idea of making a journal card is fantastic. I don't work with them myself but know many people that enjoy working with them. Great card.